Fantastic!! Thanks, I’ll add it to the post! Oh yeaaaahhhh. I saw that during my research for the post, but I forgot to include it. Thanks, Andrew! The highest possible tile would be two to the seventeenth since you could have two fours, one of which would have just appeared after the last slide, and then also have the next fourteen powers of two lined up in order all the way up to two to the sixteenth, and then all of them could be combined in order and then get two to the seventeenth. This is an incredibly unlikely scenario, but I believe it’s theoretically possible. Unless of course somebody comes up with a 2048 version of Hatetris in which case that 4 will never show up. Actually, you would never even get close to that far. You might not even be able to get the 2048 tile. That’s an interesting question: If you’re playing an opponent, can a skilled one always prevent you from getting the 2048 tile? Or can a sufficiently skilled play always outplay even the most skilled opponent and get that tile? I guess that’s similar to asking if every game is potentially winnable. I played the fibonacci game and discover something that surprisinly worked!! I beat the game after the fist time (needed some luck of course) and then tried something out. From the very beginning you move as following: right , down, up, left and repeat. I thought it’d go nowhere and looked really messy at some point… All of a sudden the spread out tiles combined, cleared almost everything and built the 377 tile!! That’s really interesting, Navi. Have you used that more than once? I want to try it now. Okay, I finally finished my own epic post on the subject (and other related stuff). It’s here. I hope you enjoy it. Played Fibonacci version and win. It’s easyer than 2048. That it’s pretty esay as well. I always reach 2048. 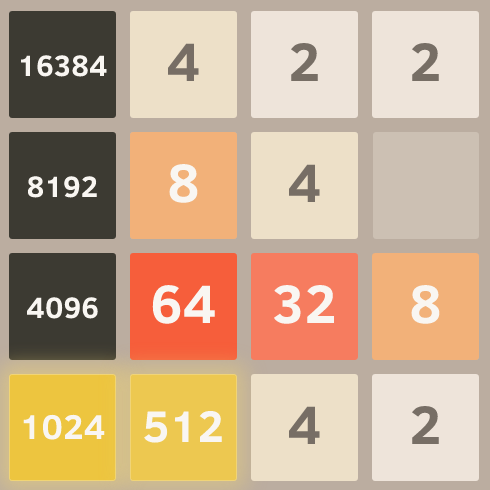 My best has been 8192. I absolutely love this game, me and all my friends constantly play it. my friend ed beat the game on his second try! My family is obsessed with the 2048 game. I appreciated this article because even a laymen like me could understand it. If there was something I didn’t know you included a link for further investigation. For example, I had no idea what the Fibonacci sequence was so I simply clicked on the link, which led me to a video. The video made it look like the Fibonacci sequence creates a cochlear spiral thingamajig, which probably has a fancy name. Time for more mathematical investigation…. Hey Autumn. I love your comment. The mathematical, link-clicking, investigation is exactly what this site is about. I’m so glad you’ve found it. Oh, interesting! I imagined something slightly different. For a triangular 2048, I think I would have had three directions instead of 6. In your game they would be the Q, E, and S directions. When you hit Q for example, the triangles slide as far as they can to the left, in the same they slide as far as they can in 2048. Maybe you’ll code that version too!? Yes, that would be interesting to explore – maybe a future project! One problem would be that in a triangular grid the tiles have one of two orientations (pointing up or down) so the whole concept of sliding gets obscured a little bit. But maybe it could be done. Great point about the orientation!! We could let let them change orientation to fit their cell. That seems like the simplest way to do things. These are really cool! I’m getting some ideas for my math project from here! Thanks! Jen- it seems like the numbers on the tiles are a little different (50% larger in 3072), but that 3072 and 2048 are actually the exact same underlying game. Aren’t the strategy, objectives, and game play exactly the same? I made a “sandbox” version of 2048 for Android that allows any grid size from 1×1 to 32×32. You can also change the starting number from 2 to 3 or 4 or nearly anything else you could want. You can even edit the type of tiles inserted after each move and change the probabilities of where they are inserted. I’d be delighted if you added it to your list of variants! This game is really fun and addicting. The only thing I don’t like about is, it takes a lot of thinking, where to move next so everything works out.